The achievement of our team in reaching last season’s cup finals brought back memories of other finals enjoyed by the club in the 1980s when ‘giants were slayed’ and trophies were actually won. Perhaps the finest achievement was by Fred Beaumont’s team when they recorded two cup final victories over Southend United. The first in the 1982/3 final of the Essex Thames-Side trophy and then in the final of the Essex Senior Cup in 1983/4, a result which avenged a defeat by the Shrimpers the previous season’s final. 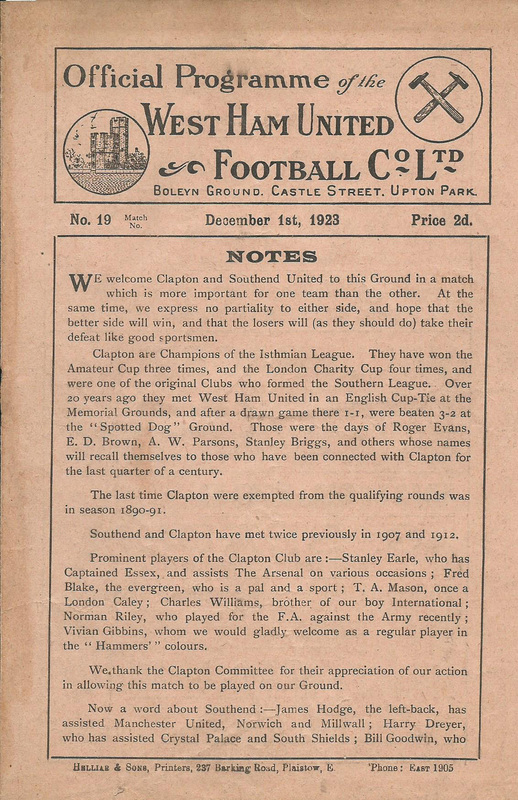 However, perhaps the biggest game between Clapton and Southend United took place on December 1st 1923 in the fifth qualifying round of the FA Cup. Described as ‘Clapton’s Plucky Fight’ in the journals of the day, a crowd of 16,000 at West ham’s Upton Park, witnessed a fine match, in difficult conditions. The professionals from Essex were much the better team in the first half and their excellent combination and accurate passing frequently had the Clapton defence guessing. The Shrimpers scored twice before the interval. It was not unusual in matches between professional and amateur teams that the fitness of the former would eventually be evident and that the second period would normally belong to the pros. However, Clapton were commended for their ‘fine stamina’ and kept Southend going to the finish. The second half was shared, a goal apiece, the Clapton effort coming from the penalty spot by Stanley Earle. The reason for the move to Upton Park was for public safety and the decision was lauded in the press. 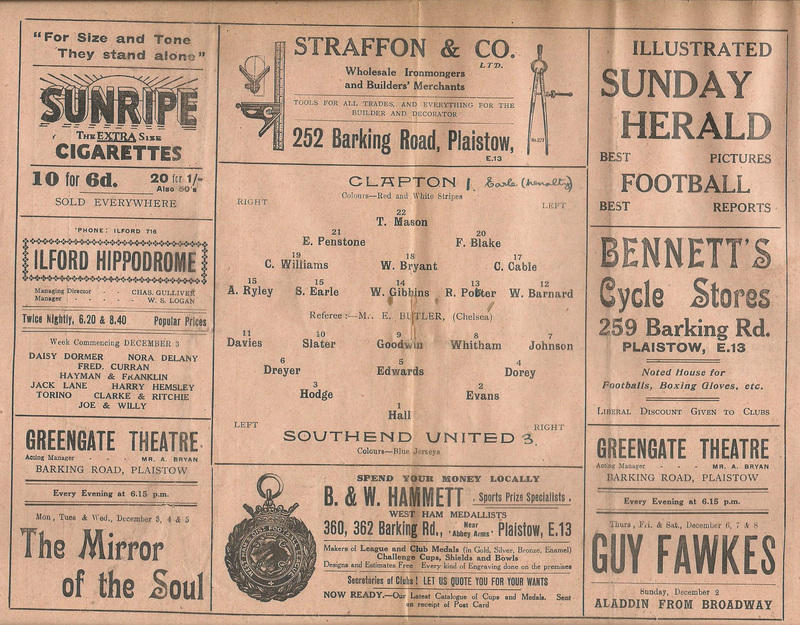 “Clapton are so true to the amateur traditions that their supporters will not need the assurance that the transfer was not made for material gain.” Doesn’t one love irony, even 92 years later? Gate receipts for the match were £933. I cannot find any record of the Southend scorers, for which I apologise to Chris Wood and Brian Jeeves, both of whom are Shrimpers fans with indelible links to the Tons. Next Next post: Clapton, The FA Vase Flops ?